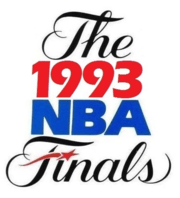 The 1993 NBA Finals was the championship round of the 1992–93 NBA season, featuring the Chicago Bulls, led by Michael Jordan, and the Phoenix Suns, winners of 62 games and led by regular season MVP Charles Barkley. The Bulls became the first team since the legendary Boston Celtics of the 1960s to win three consecutive championship titles, clinching the "three-peat" with John Paxson's game-winning 3-pointer that gave them a 99–98 victory in Game 6. This series was also notable in that the road team won each game, with the exception of Phoenix in Game 4. In the 1992 offseason, the Suns made a blockbuster trade, acquiring Charles Barkley from the Philadelphia 76ers in exchange for Jeff Hornacek, Tim Perry and Andrew Lang. They also hired Paul Westphal as head coach, unveiled new logos and uniforms, and moved to the then-brand new America West Arena from the Arizona Veterans Memorial Coliseum. The Suns made the most of these moves, winning a franchise record 62 games. Barkley's efforts won him the MVP award. In the first round of the Western Conference playoffs, the Suns eliminated the Lost Angeles Lakers in five games. In the second round the Suns defeated the San Antonio Spurs in six, and were again pushed to a decisive game by the Seattle SuperSonics before ultimately winning in the conference finals. For the Suns, it was their first NBA finals appearance since 1976 and second overall. It is also worth noting that Phoenix displayed an introduction animation similar in fashion to Chicago's now famous introduction animation, both of which were set to the same song, before the game, which was remarked upon by the commentators. Also, before the game a moment of silence was observed in memory of New Jersey Nets guard Dražen Petrović; who was killed in a car accident two days earlier. Both teams came were locked in battle throughout the first quarter until Chicago took over in the 2nd quarter shooting at a greater shooting percentage. In the 2nd half, the Suns begin to put more pressure on the Bulls, but late in the 4th quarter with time running out, it would come down to a battle of determination. Scottie Pippen blocked Danny Ainge's 3-point attempt to seal the win and Phoenix becomes the first team to lose their home-court advantage twice in the first two games of the NBA Finals. The Phoenix Suns won Game 3 in 3OT, 129–121. Suns Head Coach Paul Westphal became the only person to appear in both triple-overtime finals games: the first was the classic 1976 contest against Boston, in Game 5 as a player. His Suns also appeared in that year's finals, thus becoming the only team to appear in two triple-overtime finals games, the first of which they lost 126–128. Westphal made a shocking decision that paid off, as he tried to get Kevin Johnson back on track after Johnson had two terrible performances in Games 1 and 2 by having him guard Michael Jordan, and KJ played much better all-around basketball for the rest of the Finals. In Game 4, Michael Jordan was unstoppable, scoring 55 points at Chicago Stadium and making a tough driving layup late in the game while getting fouled. The Bulls won 111–105. Scott Williams, who like MJ played his college basketball at UNC for Dean Smith, joked afterwards about "being proud that the two former Tar Heels combined for 57 points." Before Game 5, Charles Barkley told the press he had announced to his teammates that they needed to win to "Save the City", a reference to the riots anticipated in Chicago if the Bulls won the championship at home. Both Paul Westphal and Kevin Johnson later expressed amusement about Barkley claiming credit for the line because they both heard Westphal make a tongue-in-cheek comment to that effect in a pregame meeting. The Bulls got off to a good start in Game 6 but struggled in the fourth quarter, wasting a double-digit lead to trail 98–94. Michael Jordan made a layup to cut the lead to 2 points, and Dan Majerle's 30-foot three-pointer fell short on the Suns' next possession. Trailing 98–96 and playing a Game 7 on the road if they lost that day, Chicago ran a play that Phil Jackson called "Blind Pig" that had them increasing the play's "thrust" by bringing the ball from 3/4 back of the basket. Although Westphal's sole instruction on the play was for none of the players to double-team any of the Bulls (even Michael Jordan), Danny Ainge left John Paxson to try and either steal the ball or foul Horace Grant, who had missed all five of his shot attempts in the game and wasn't a good crunch-time free throw shooter. Grant saw Paxson alone 25 feet from the basket and fired a perfect pass, and Paxson then made a three pointer with 3.9 seconds left, giving the Bulls a 99–98 lead. Paxson's three-point field goal was the only score by any Bulls player other than Michael Jordan in the entire fourth quarter. The victory was secured by a last-second block from Grant on Kevin Johnson. God want [sic] us to win the World Championship..... I've talked to him the other night. — Phoenix Suns power forward Charles Barkley commenting on his belief in his team in a post-game interview with NBC's Ahmad Rashād following Game 5. Here's Paxson for three! YES! The Bulls take a one-point lead and Phoenix calls for time with three and nine tenths seconds remaining in the fourth quarter! John Paxson converts a three-pointer. It's Chicago, 99 and Phoenix, 98. Here's Johnson. Johnson gets...No! He cannot get it off! Knocked away by Grant! It's all over! The Chicago Bulls have made it three straight NBA Championships! Michael Jordan will inbound. Pax waiting for B.J. to come back and Michael flips it in to B.J. back to Michael. Michael, 11 seconds...across the timeline, it comes, goes to Pippen...Pippen runs down the lane...dumps it out to Horace...Paxson, for three, YEAH! YEAH! A month after the Bulls’ third straight championship, Michael Jordan's father, James R. Jordan, Sr., was murdered. Distraught by the murder of his father, Jordan announced his retirement from basketball a few weeks before the 1993–94 NBA season began, citing a loss of desire to play basketball. Even without Jordan, the Bulls still managed to win 55 games behind the All-Star efforts of Scottie Pippen; however the loss of Jordan was steep to overcome, and, following a controversial call that gave New York the Game 5 win, the Bulls would go on to lose to the New York Knicks in the Conference Semi-finals of the 1994 NBA Playoffs in Game 7. Jordan would return from retirement in March 1995, following a brief baseball career and made the 1995 NBA Playoffs, losing to the Orlando Magic in six games. Game 5 of the Finals between the Bulls and Suns was the last NBA Finals game played at Chicago Stadium. The Phoenix Suns would finish with 56 wins in the 1993–94 season, but were eliminated from the playoffs by the Houston Rockets after leading 2–0 in the Western Conference Semifinals. The following year, Phoenix took a commanding 3–1 lead against a sixth-Seeded Houston team only to lose again, losing Games 5 and 7 on their home court, the last of which was decided on a 3-pointer by Mario Elie and an ensuing free throw session. The Rockets went on to win both the 1994 and 1995 NBA Finals. As of 2016 this remains the Suns’ last Finals appearance. In a last-ditch attempt to win a championship, Barkley was soon traded, ironically, to the Rockets in 1996 for Sam Cassell, Robert Horry and Chucky Brown. Despite forming a "Big Three" with Clyde Drexler and Hakeem Olajuwon, the Rockets failed to make the NBA Finals in Barkley's four seasons. The 1993 Finals would be the only appearance of Charles Barkley's Hall of Fame career.